The UK Cloud Awards celebrates innovation in the cloud industry and is organised by the Cloud Industry Forum and Cloud Pro. The winners were decided by an expert panel of independent judges who were looking for innovation and technical excellence in the UK cloud market. The judges explained the main reasons SigningHub was chosen as this year’s winner were "the solution’s ability to work with multiple standards and continued innovation". With globally dispersed workforces, businesses require solutions that deliver significant productivity benefits. We pride ourselves on SigningHub’s combination of comprehensive security and compliance features and productivity and efficiency benefits. This enables companies to accelerate the signing process, even across borders, from days to hours while remaining completely secure. 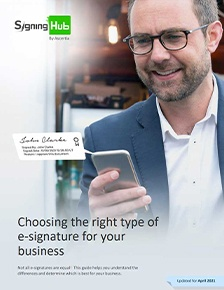 One of the many benefits of our solution is the use of advanced long-term signatures that follow the ETSI PDF Advanced Electronic Signature (PAdES) standard and comply with EU eIDAS regulation. We frequently update our solution to provide additional features to further improve the signing process for our users. We are very proud of this achievement and will continue to enhance SigningHub to offer a solution that simplifies the process and accelerates decision making without compromising on security. Read more about SigningHub’s features here.